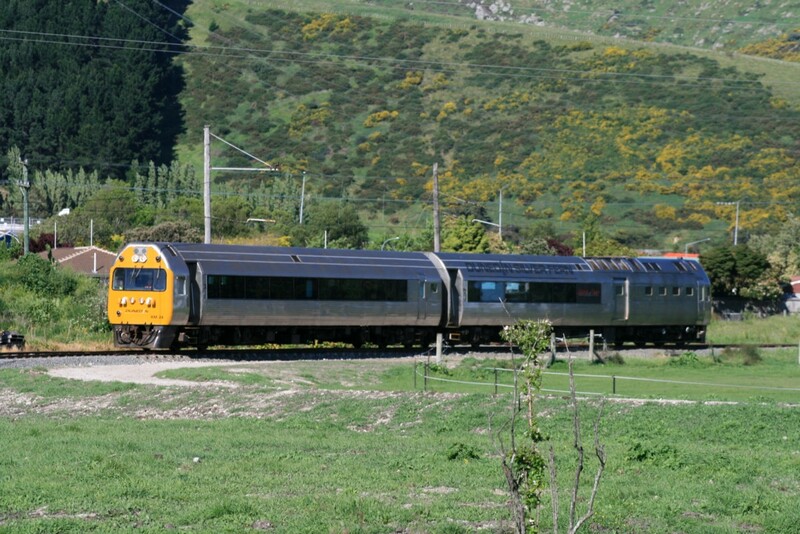 Canterbury is the centre of New Zealand’s South Island. 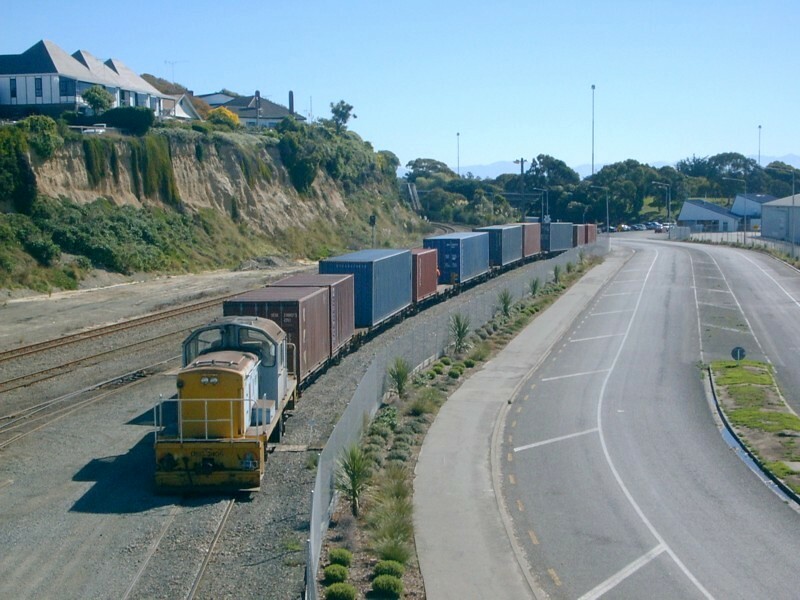 It stretches from the Southern Alps to the eastern coast. 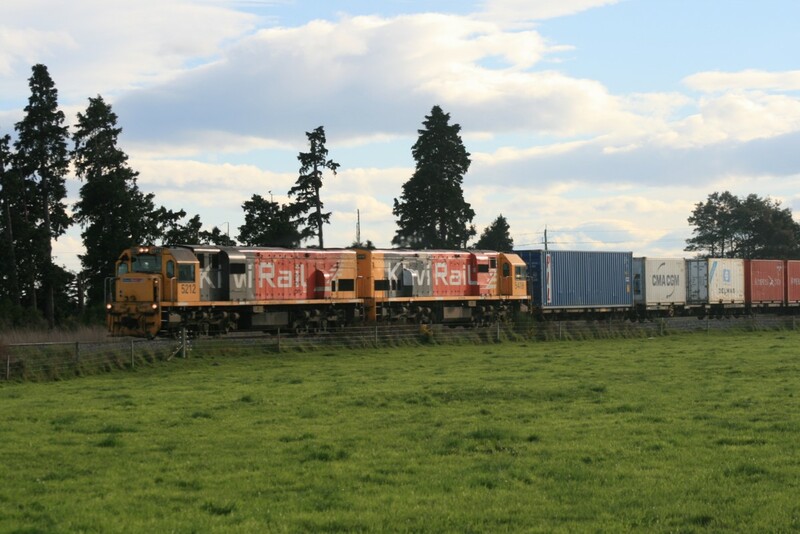 The Canterbury Plains dominate the landscape, particularly in Mid Canterbury while in the North and South, rolling countryside connects the mountains and hills with the sea. 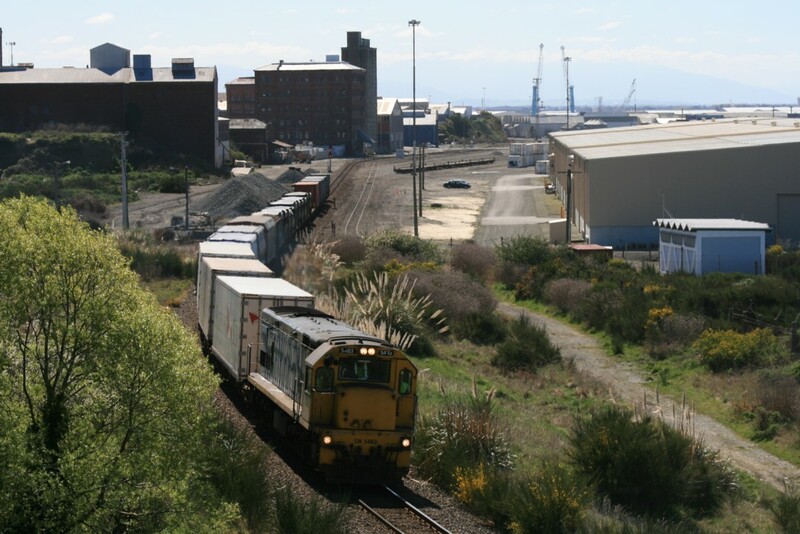 The Midland Line to the West Coast has its own page, so here I will present the remaining Canterbury railway scene, particularly around Timaru. 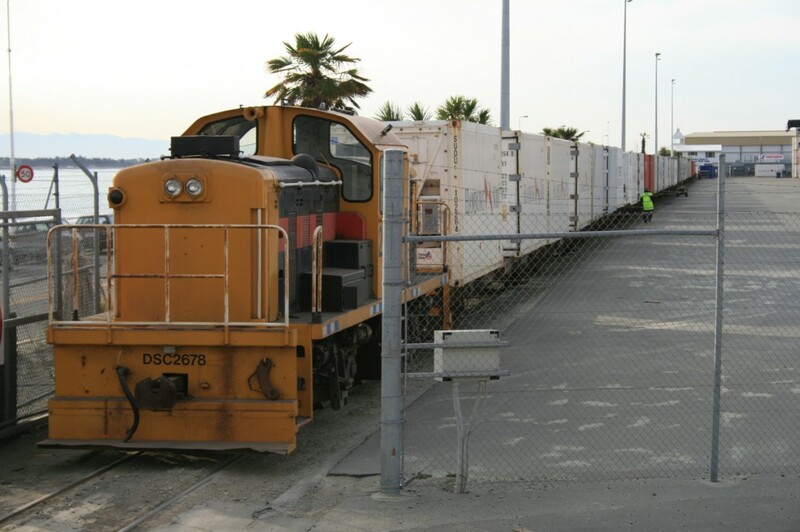 But before the state became involved, there was a change of private ownership. 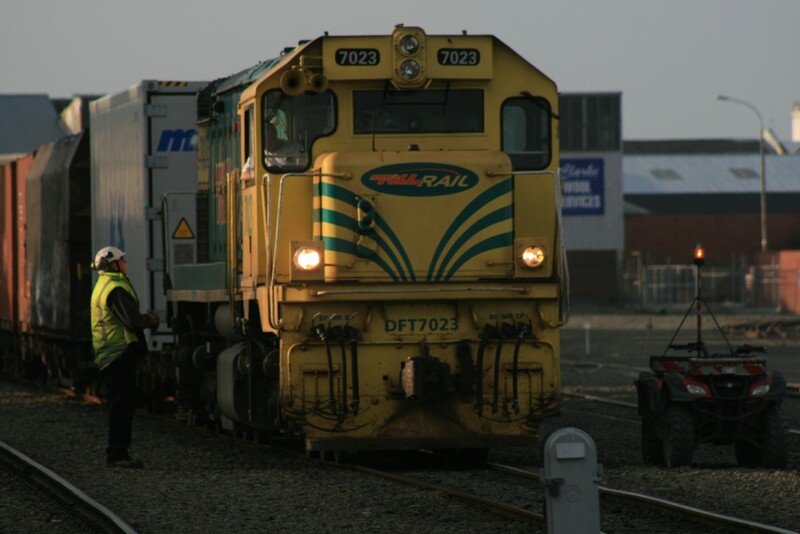 In 2003 the Australian transport company Toll bought a majority shareholding in Tranz Rail and renamed it Toll NZ in 2004, with the railway operation known as Toll Rail. 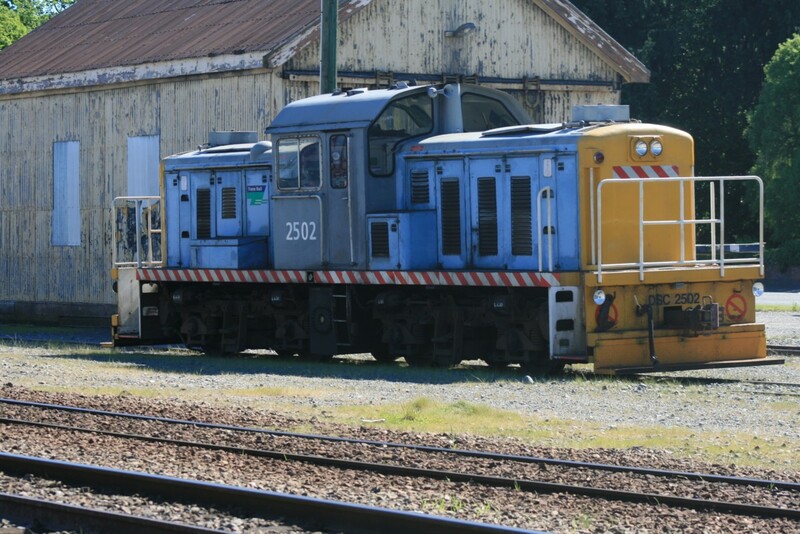 It introduced a distinctly green and yellow Australian livery, known by railfans as “corn cob”. 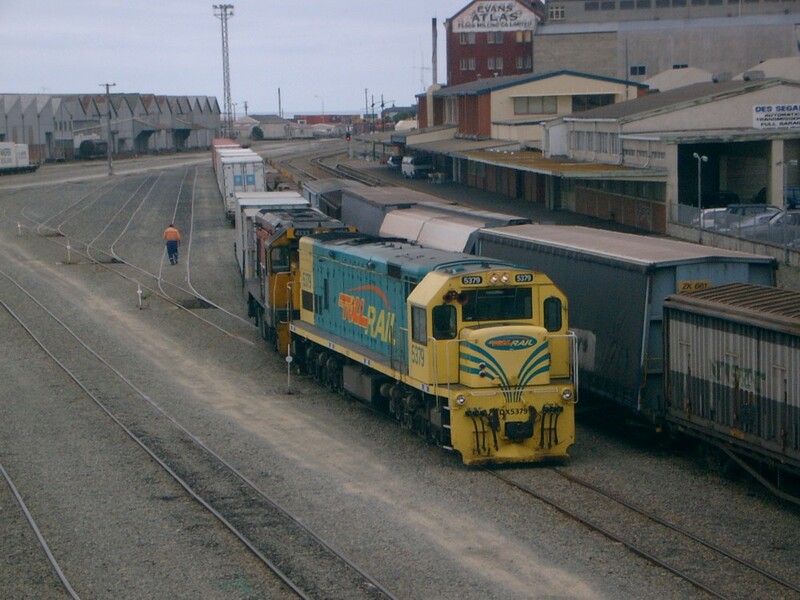 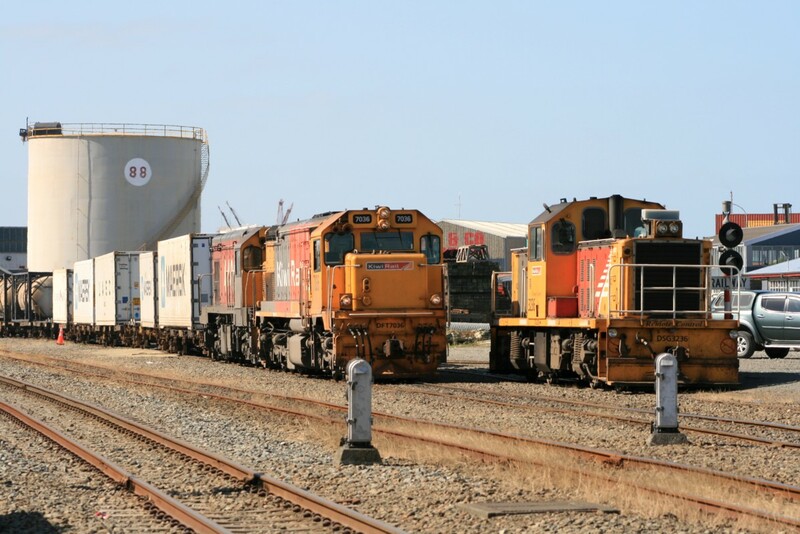 Here a DX class loco in the new livery has arrived in the Timaru yard with a DC class assisting [Feb 2005]. 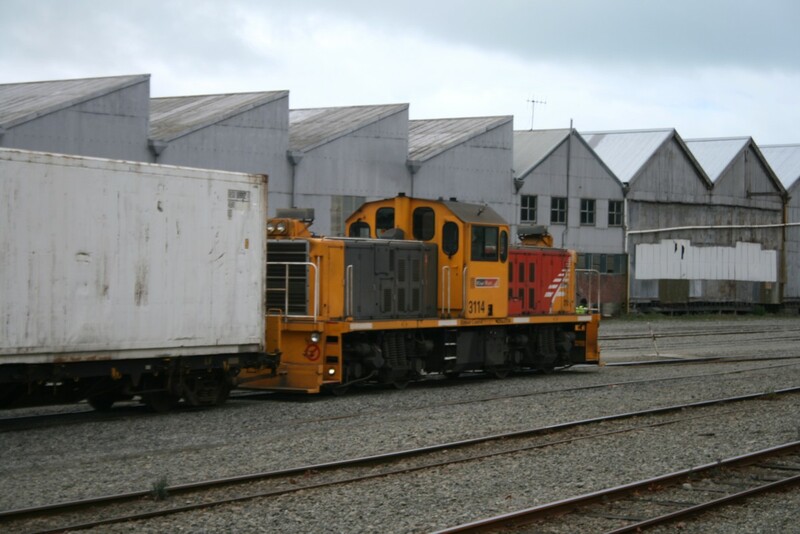 The DX class was New Zealand’s most powerful main line diesel locomotive for many decades. 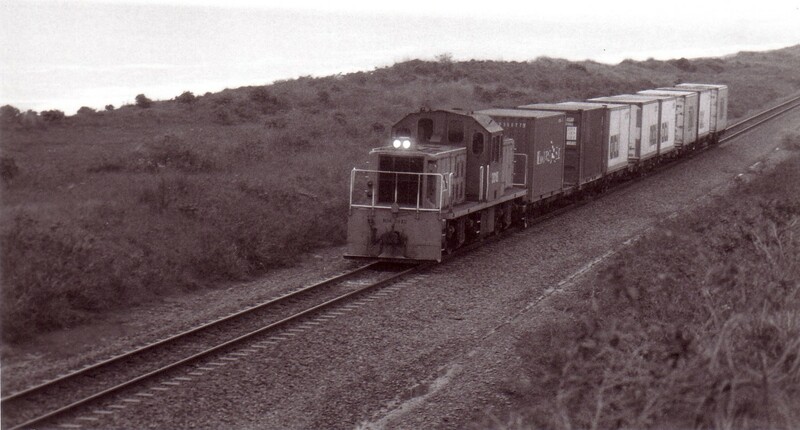 The class was introduced in the early 1970s particularly for working the North Island Main Trunk. 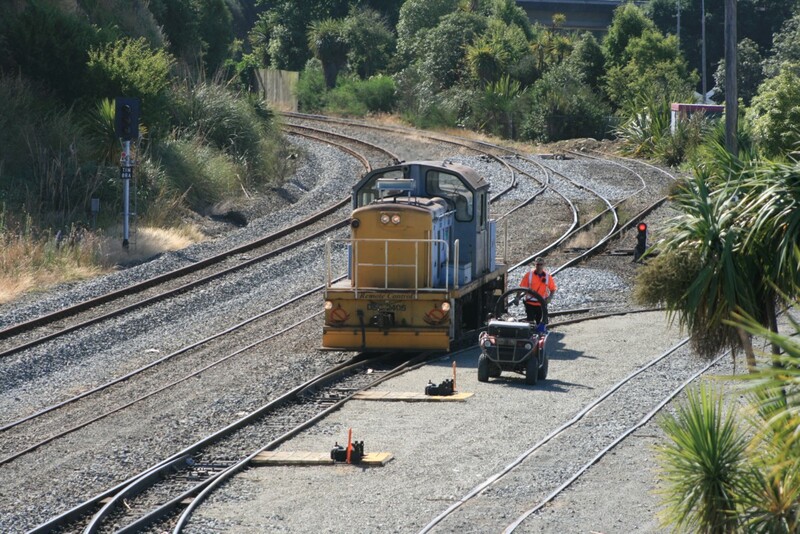 Since electrification of the main trunk, the engines are seen throughout New Zealand. 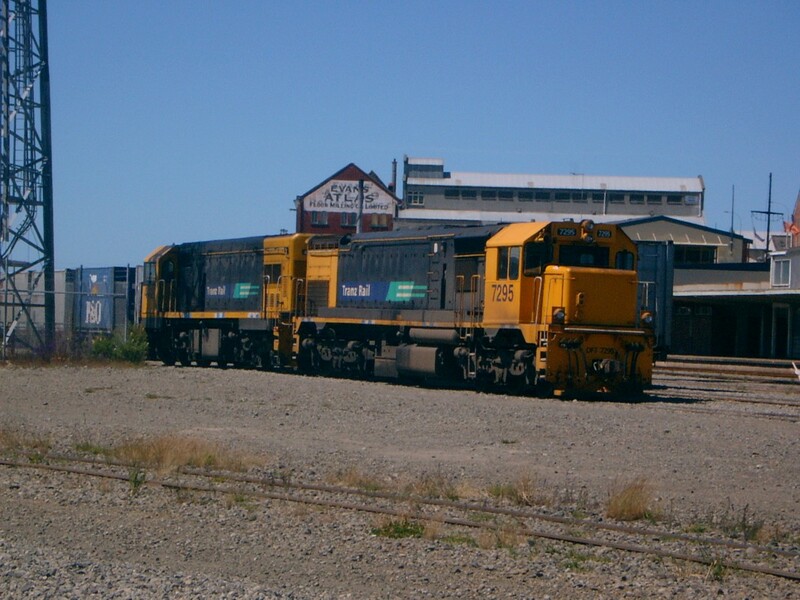 DX5483 hauls train 923 out of Timaru one day in spring 2007. 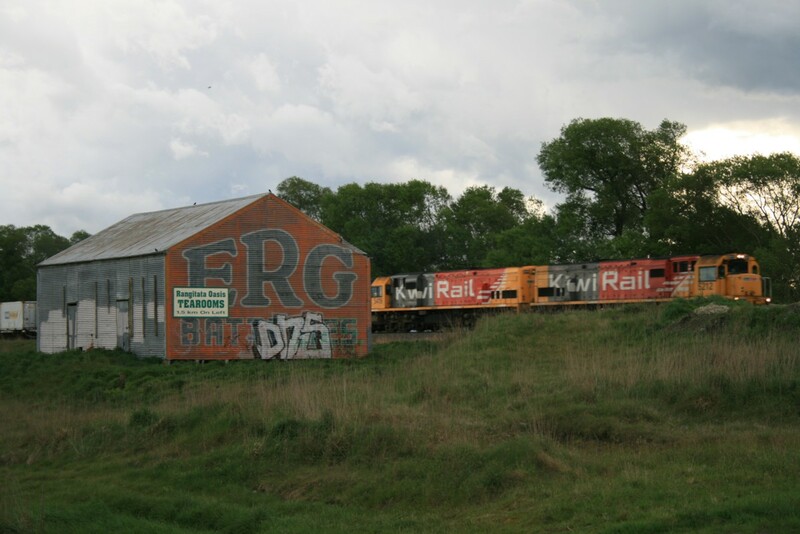 In the background on the right is the large milk powder store, while the old wheat mill and silo is visible to the left. 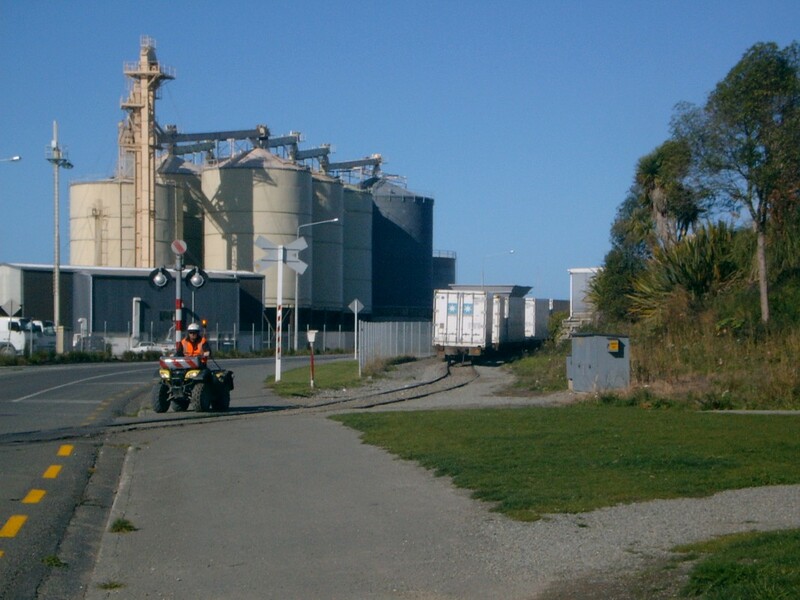 The buildings reflect the change in farming in South Canterbury, with more emphasis on dairy production and less on arable farming. 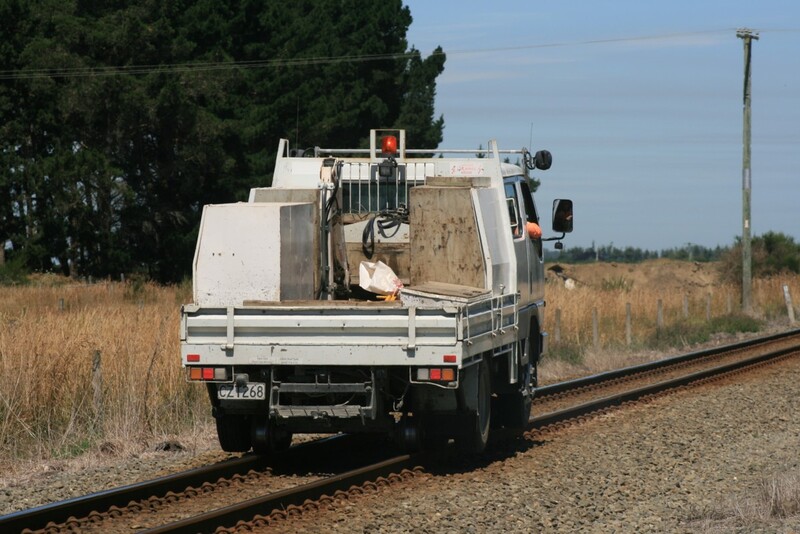 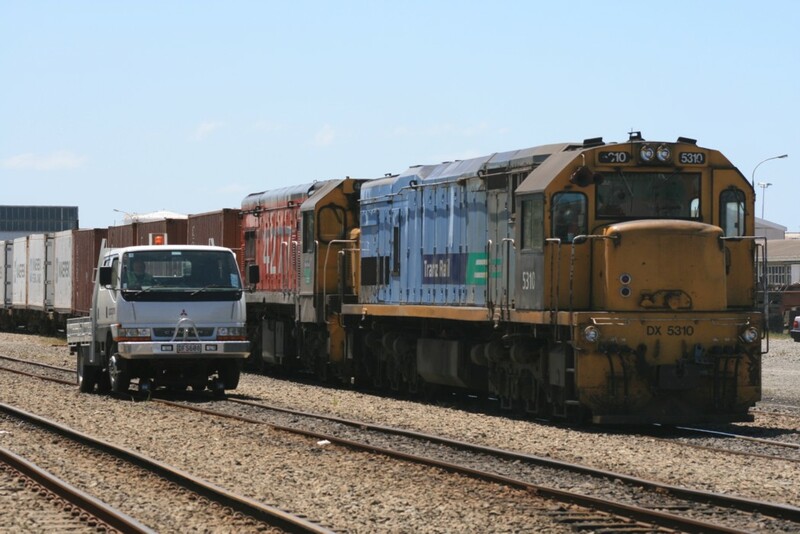 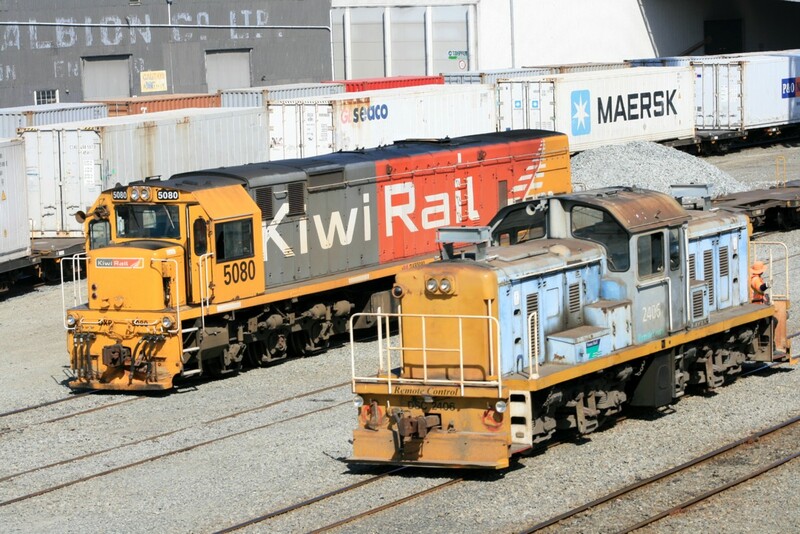 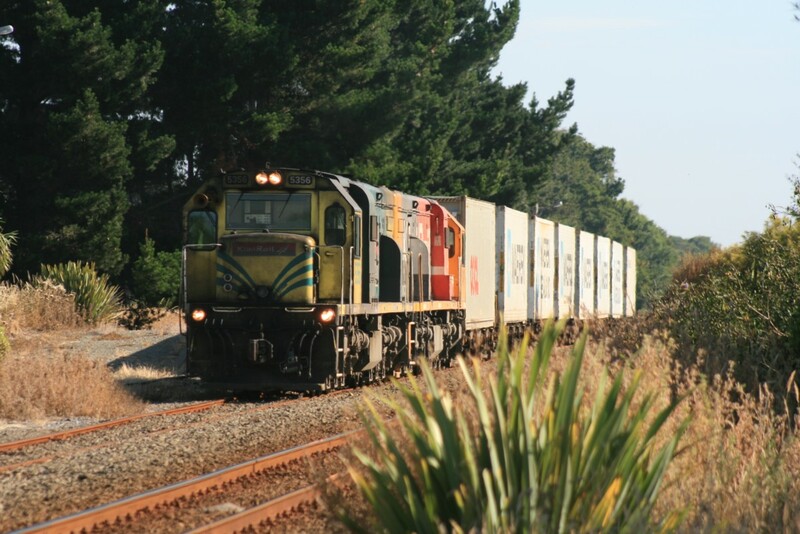 By now the KiwiRail livery has become the standard locomotive livery in New Zealand. 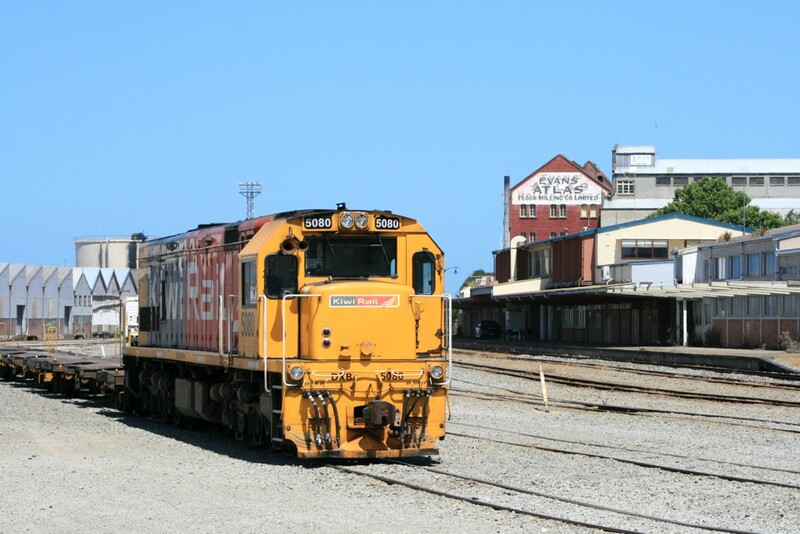 A DX stands in Timaru, ready to take a train northwards. 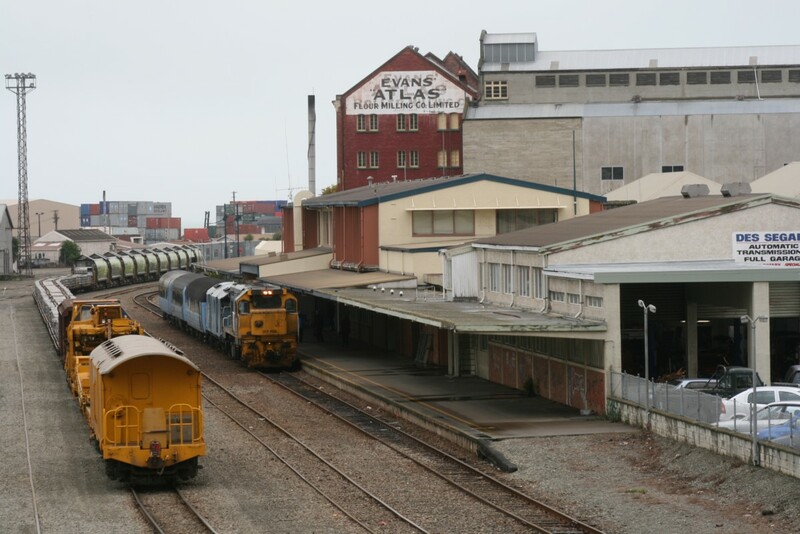 Timaru station and the old flour mill are in the background. 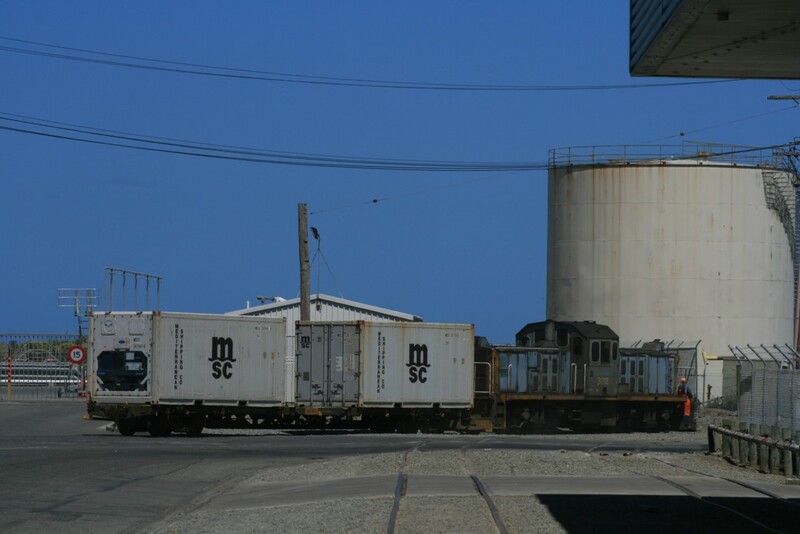 [Dec 2017]. 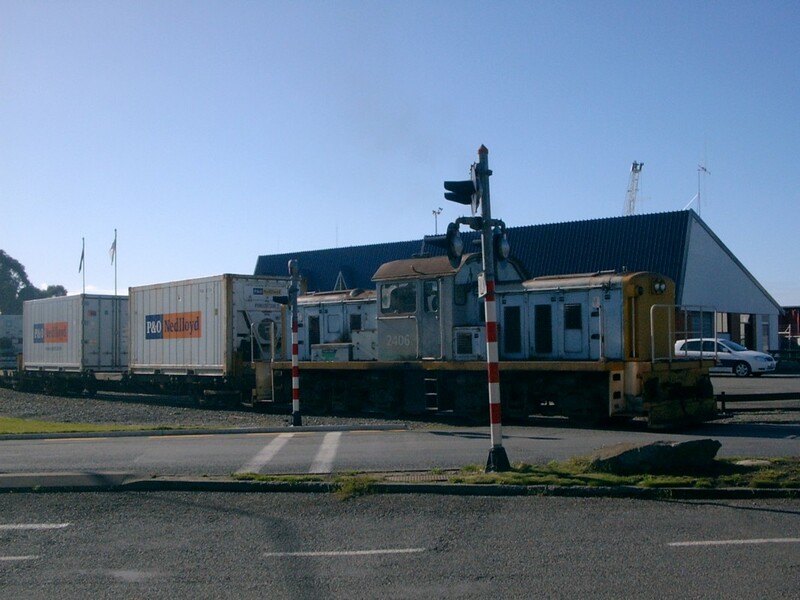 The Southerner passenger train ran between Christchurch and Invercargill from December 1970 to February 2002. 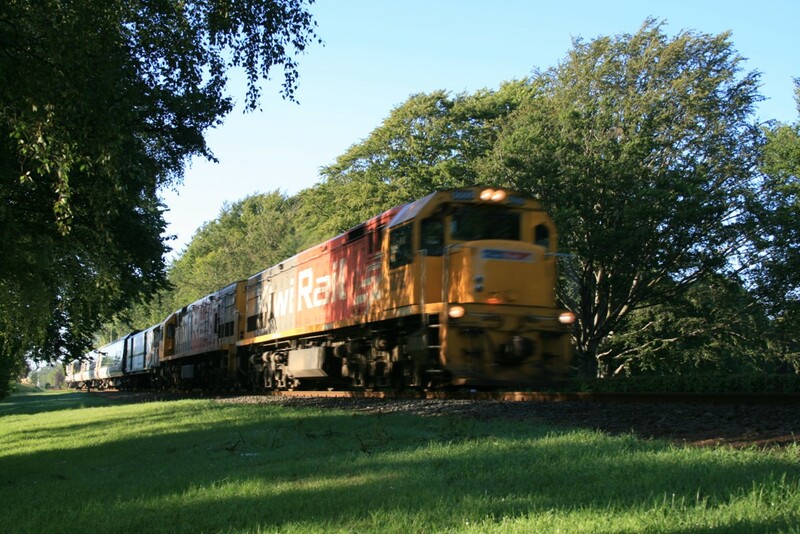 I travelled on the train regularly between Dunedin and Timaru. 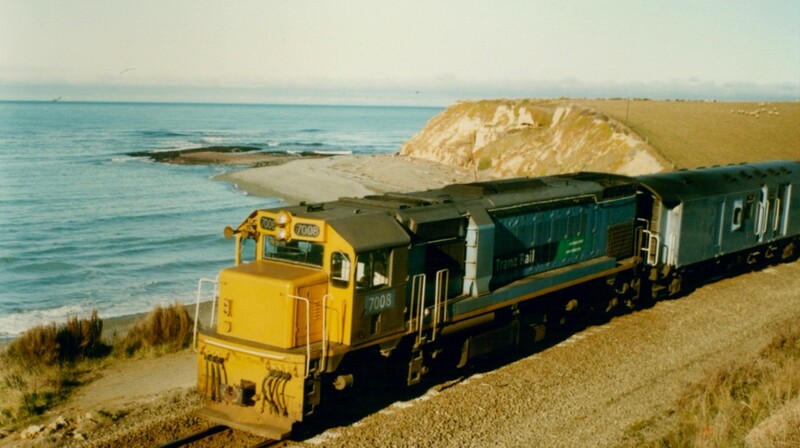 DFT7008 hauls the Southerner along the coast at Scarborough, south of Timaru. 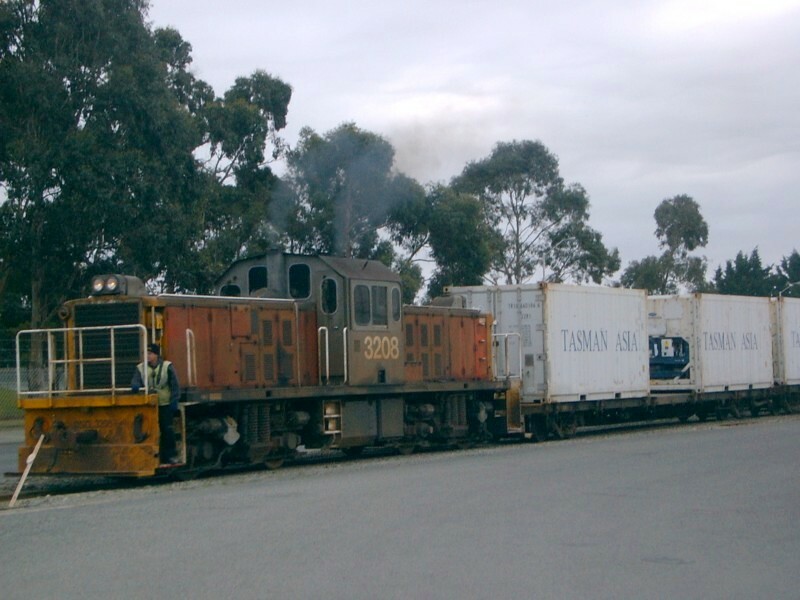 [Jul 1996]. 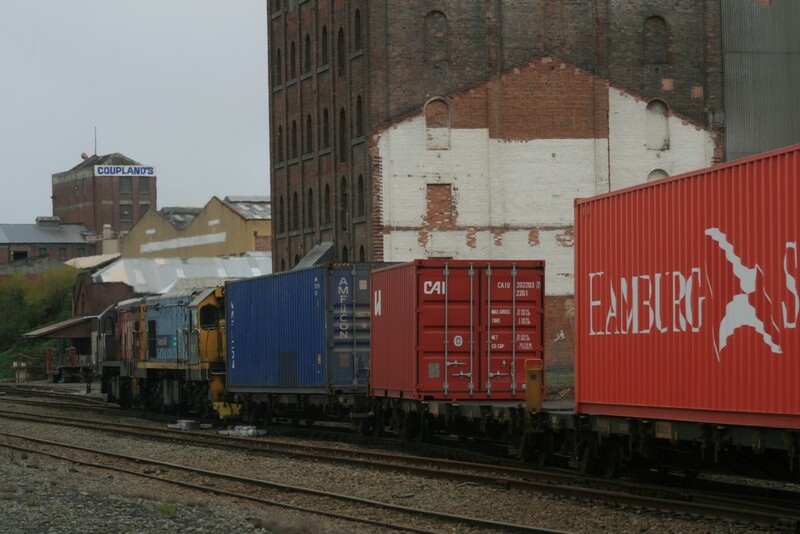 Just over ten years later, another DFT stands at just about the same point at the head of a south-bound train. 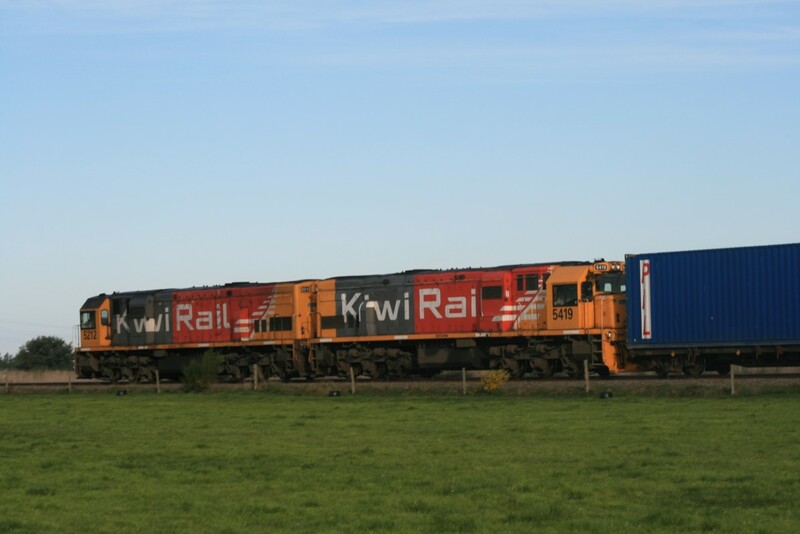 DFT 7036 is in KiwiRail livery, just as the DSG 3236 on the adjacent track. 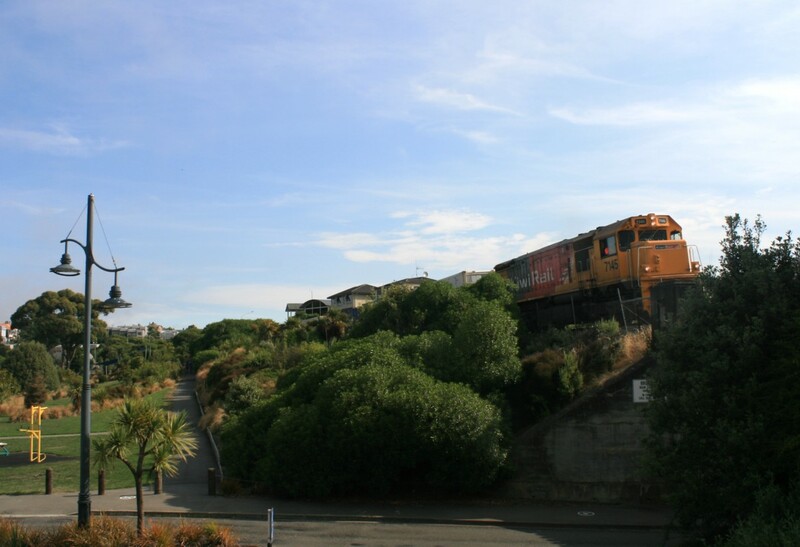 The helping DC locomotive, however, is still in the old international orange livery from New Zealand Rail days. 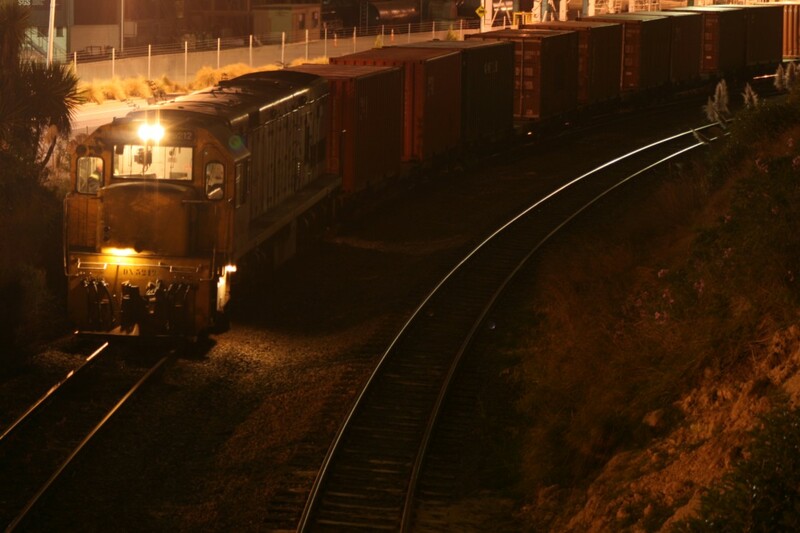 [Dec 2017]. 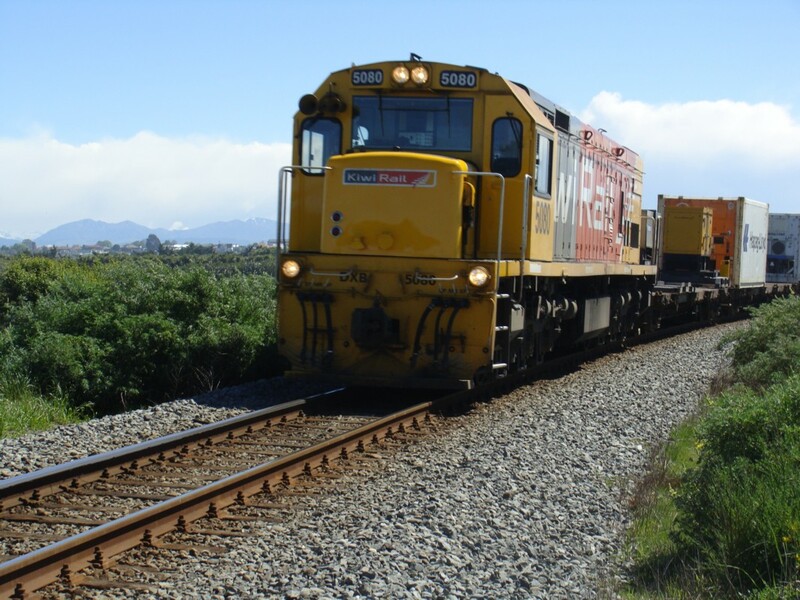 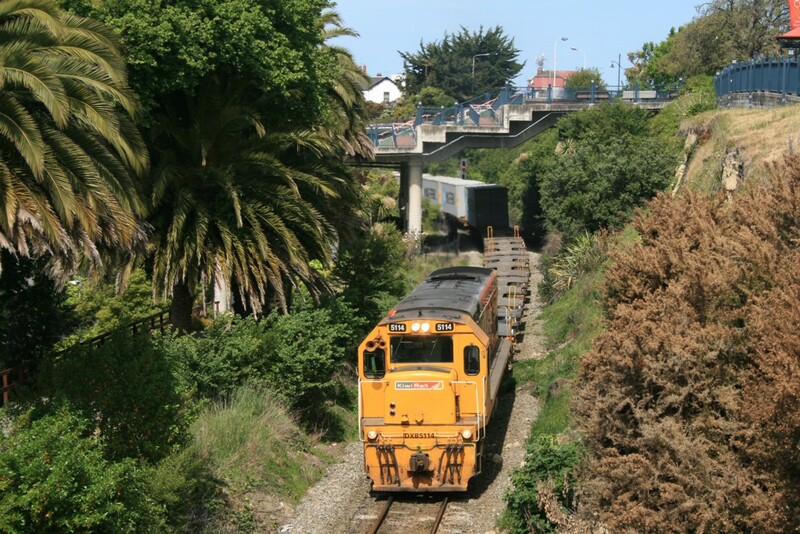 A DFT loco hauls a freight train past Caroline Bay northwards on a summer afternoon. 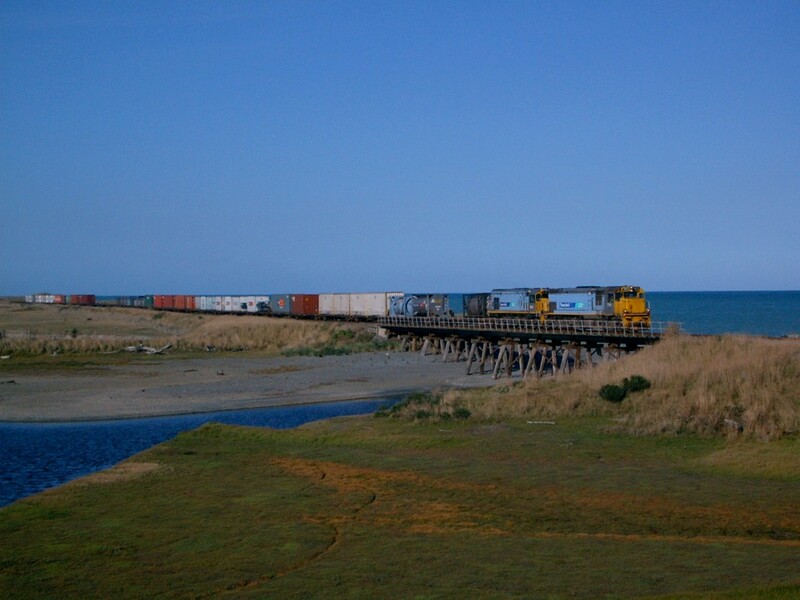 The popular recreation spot in Timaru was in full swing for the Caroline Bay Carnival at this time of the year. 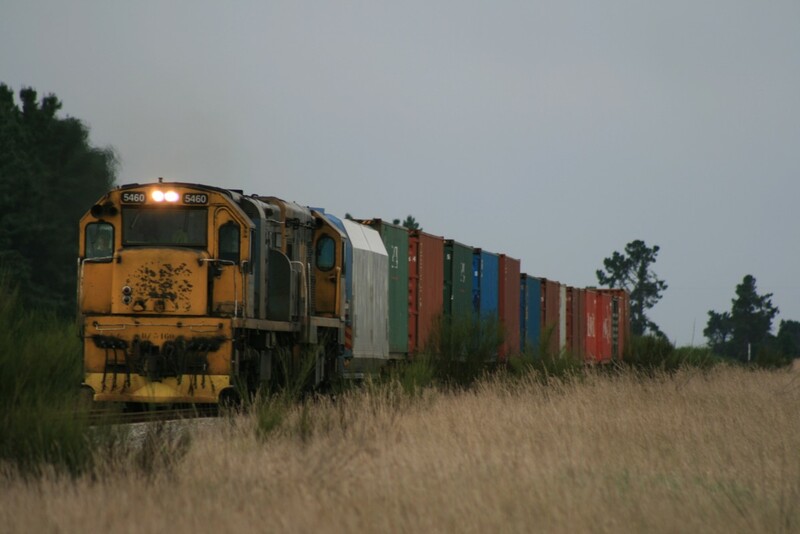 [Jan 2018]. 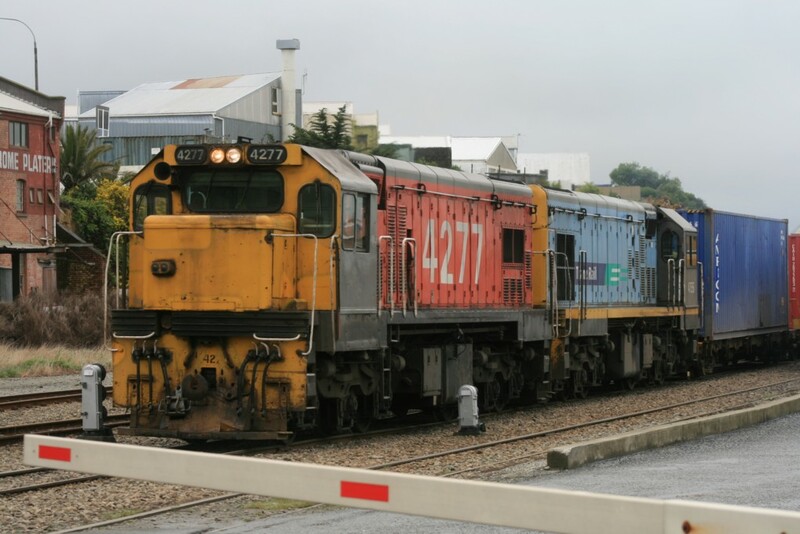 Occassionaly a Silver Fern railcar made its way into Canterbury. 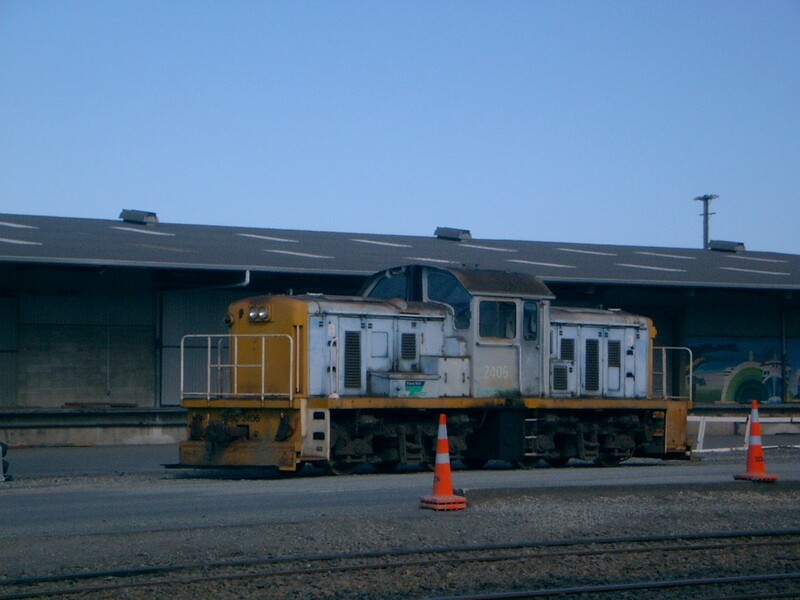 These railcars were introduced in 1972 for service on the North Island Main Trunk between Auckland and Wellington. 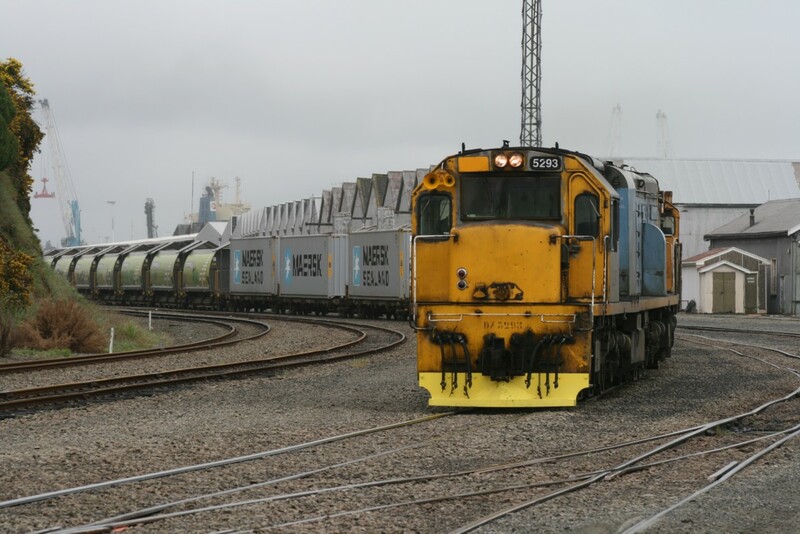 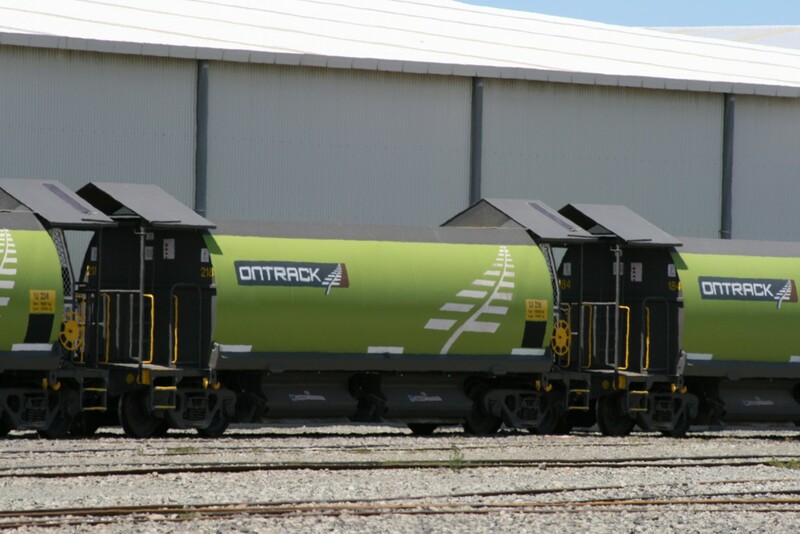 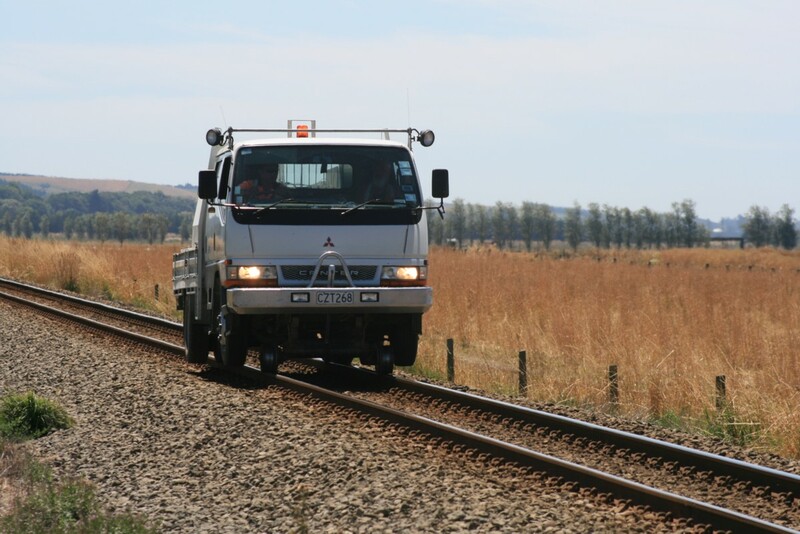 A railcar leased to Dunedin Railways was used for the 150th anniversary celebrations in Christchurch and arrives at Ferrymead. 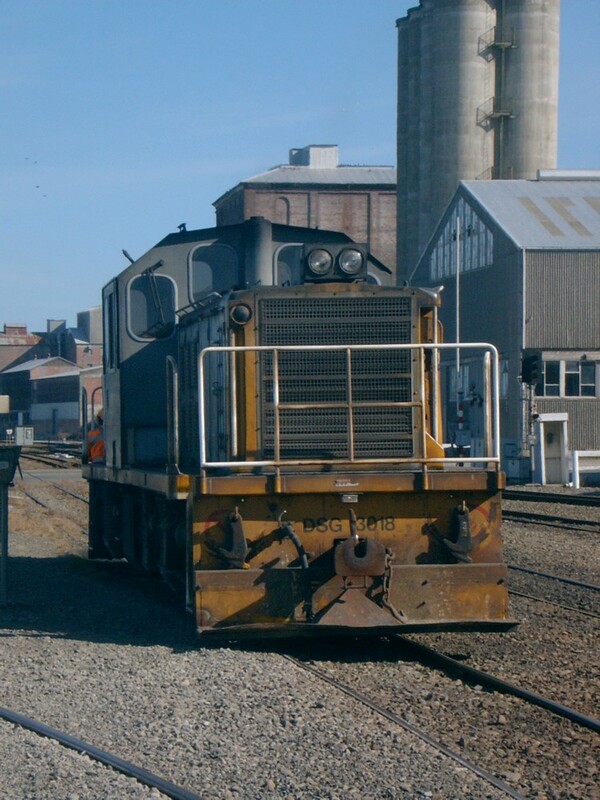 [Oct 2013]. 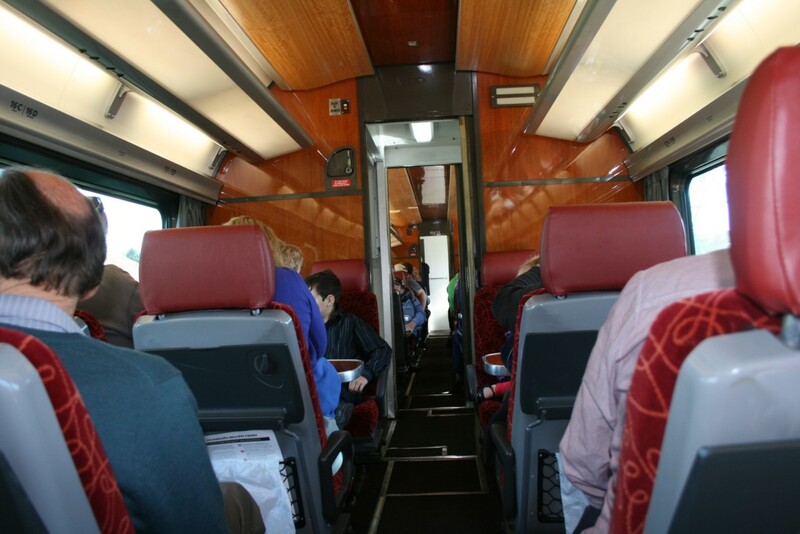 The inside of the railcar. 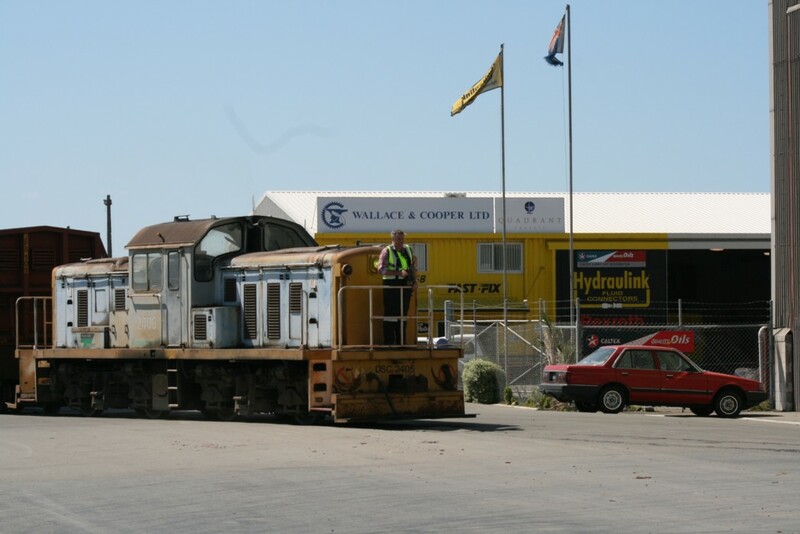 It was modernised in 2010. 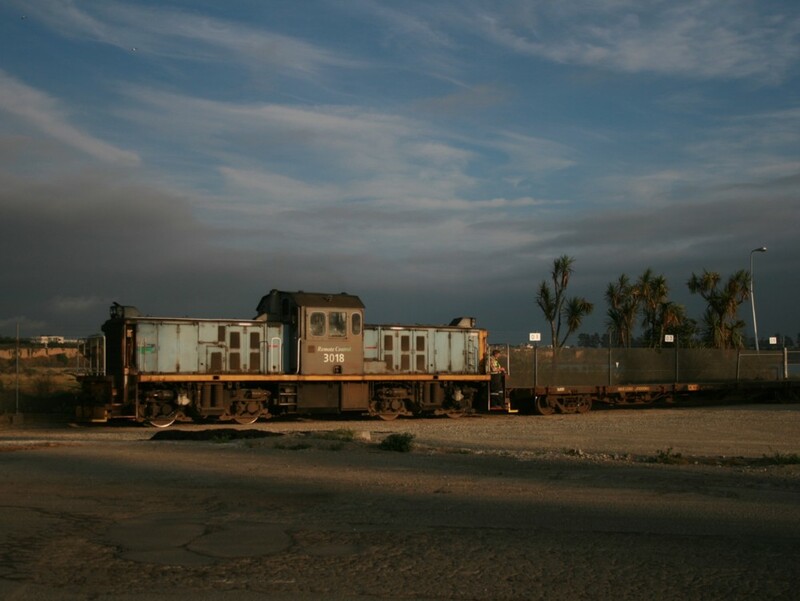 [Oct 2013]. 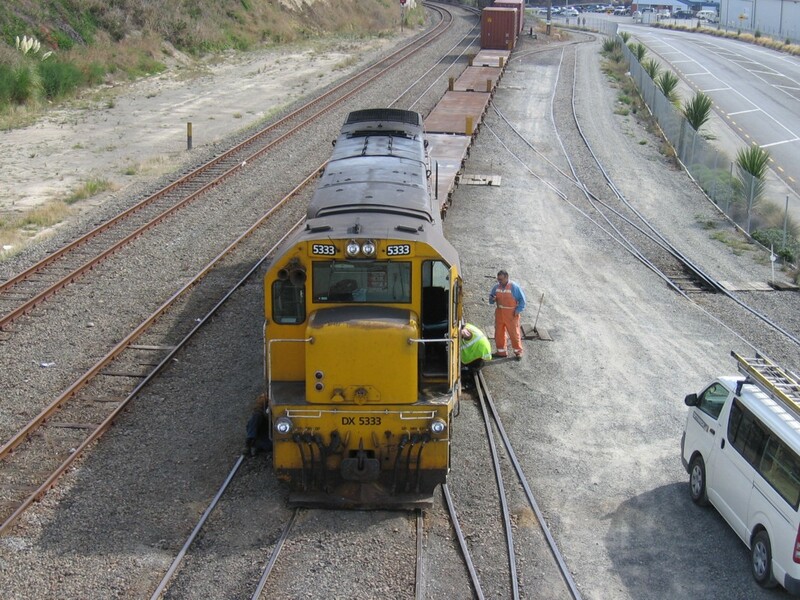 The DSC shunting engine sits on the main line in Timaru as part of a shunting move. 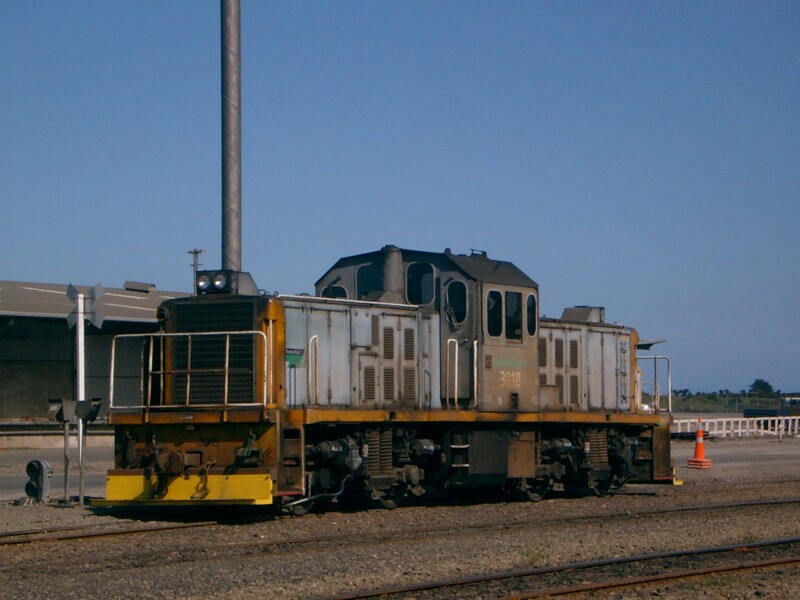 Large flood lights have been fitted to the hoods of shunting locomotives, presumably for better visibility at night. 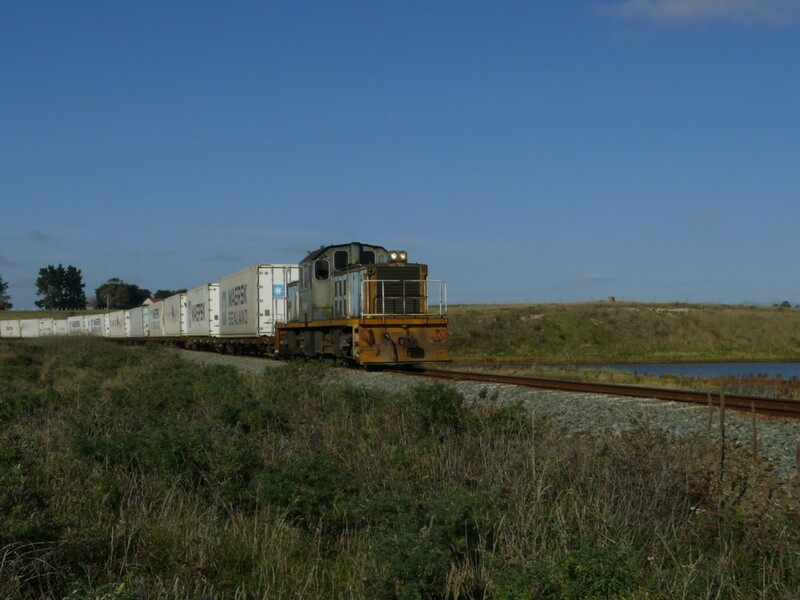 [Dec 2017]. 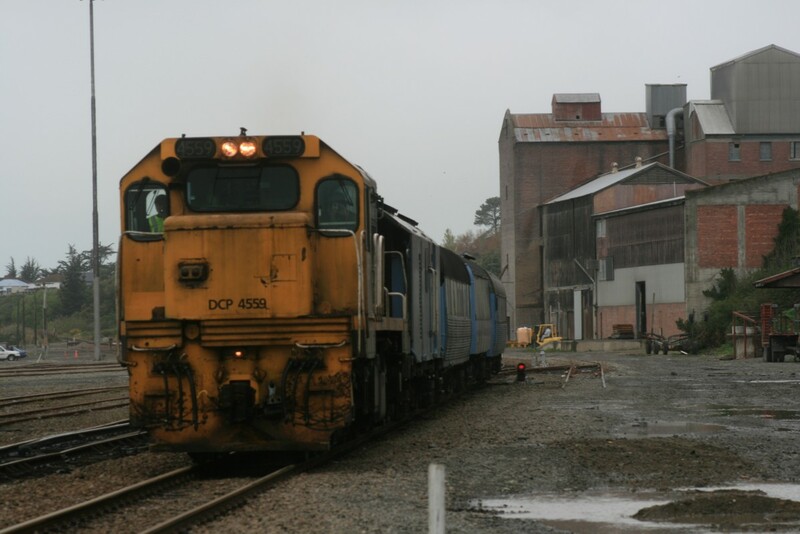 DSC 2406 trundles past DX 5080 in the Timaru yards. 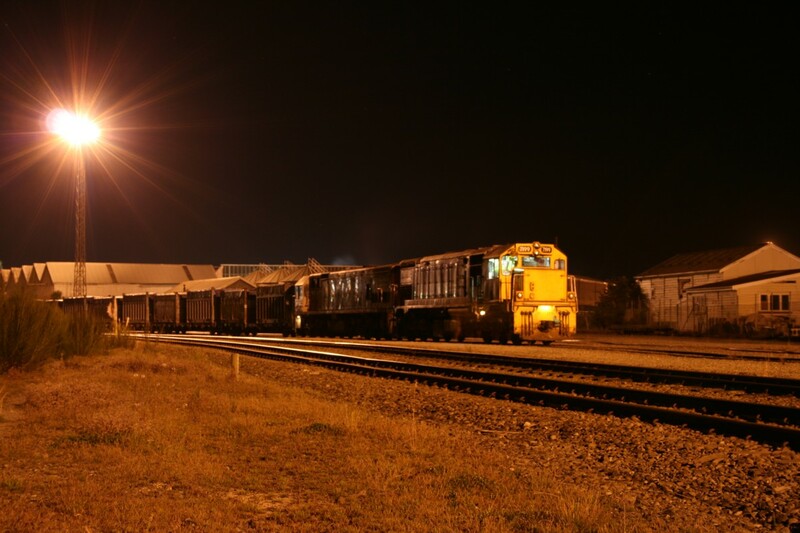 [Dec 2017]. 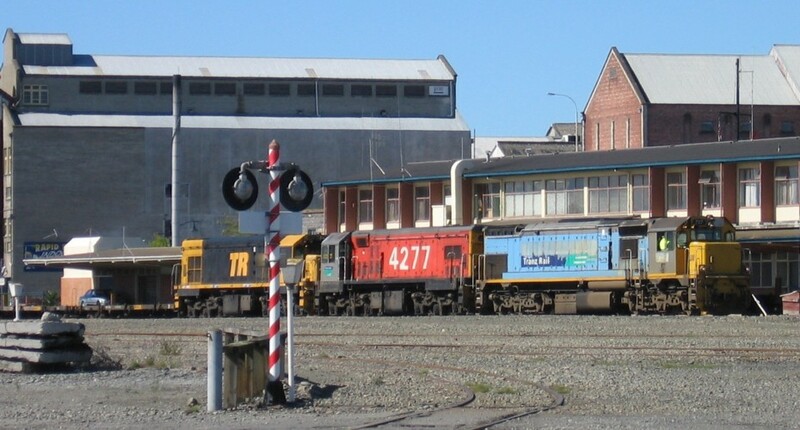 A DSG locomotive in KiwiRail colours shunts freight waggons in Timaru. 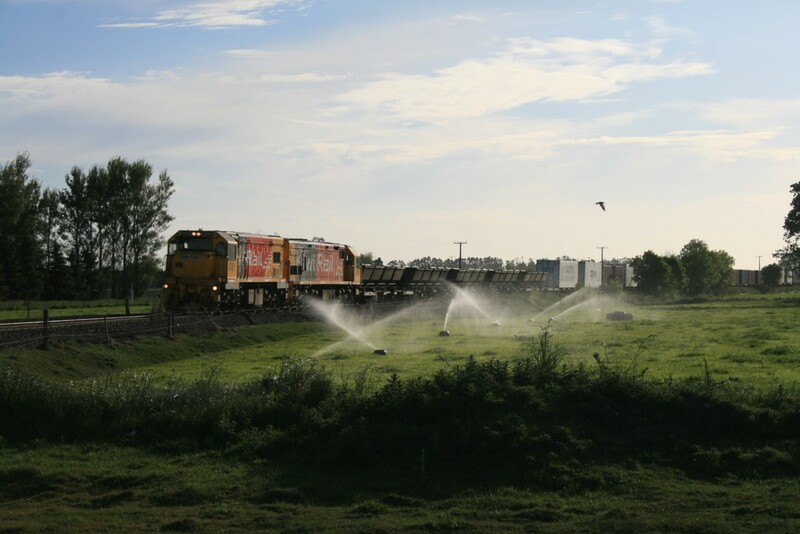 [Jun 2016]. 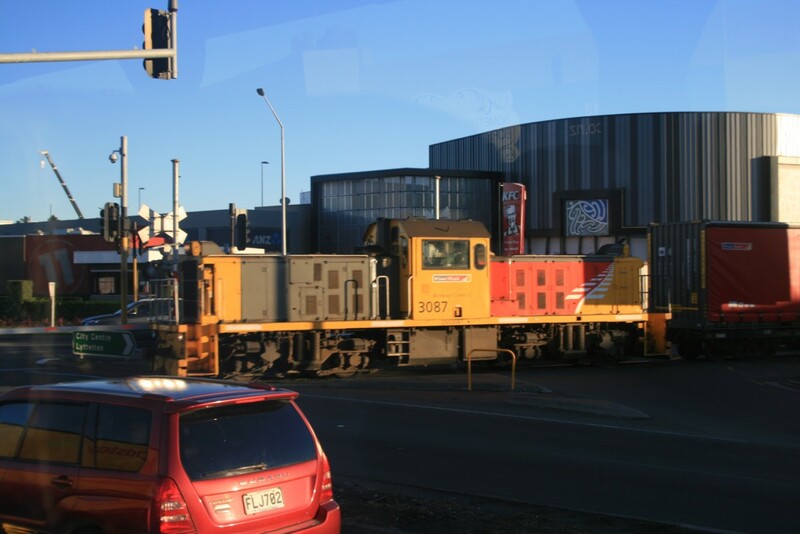 The Hornby Industrial Branch goes past the Hornby shopping centre and through the centre of Hornby, a suburb of Christchurch. 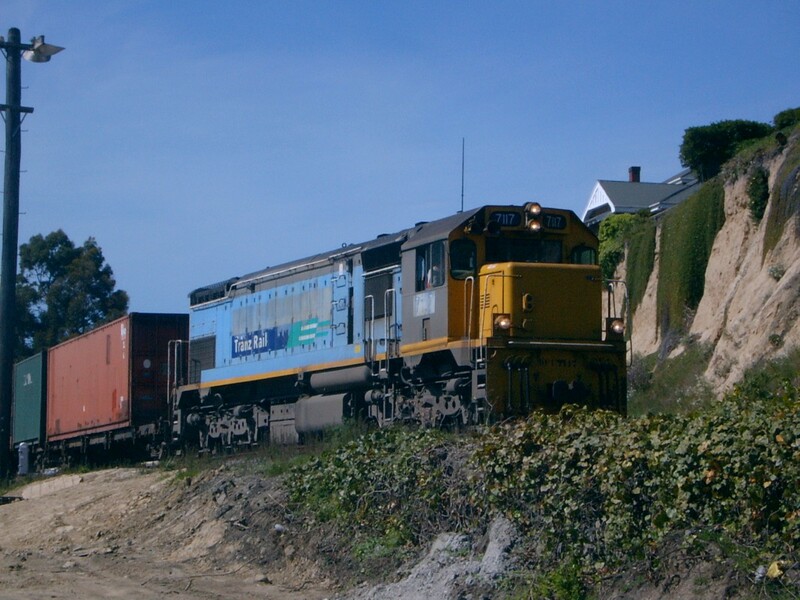 Here a DSG locomotive hauls a train across the busy intersection in Hornby. 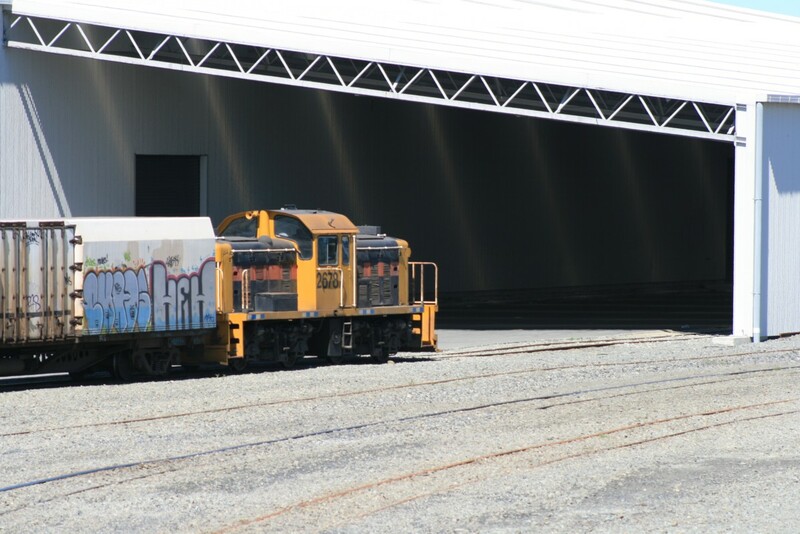 [May 2016].